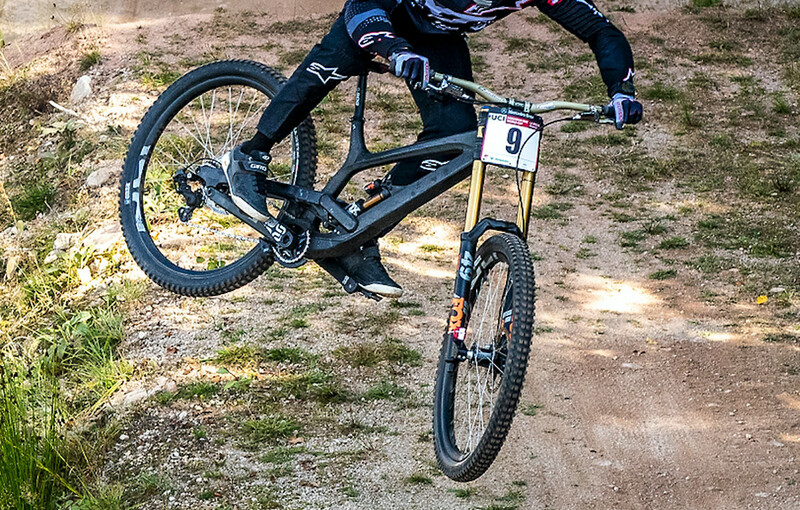 Sam Hill just won the Crankworx Garbanzo DH on a prototype Pulse. I doubt Nukeproof would waste resources on a prototype for a product line they plan to drop. Did you just set up a 16 year old with a 24 year old? As a race fan..! and this is pure speculation. 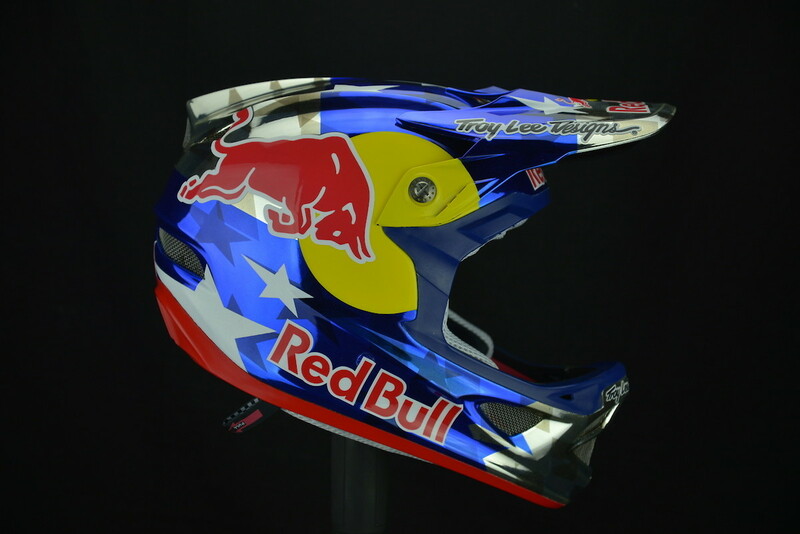 i was thinking when in the hell is Amaury Pierron getting his RedBull helmet? Maybe they'll wait until he does the double.... nah..
i think gwin is still under contract with bell. my guess would be luca shaw or maybe jack moir since they are already sponsored by TLD. 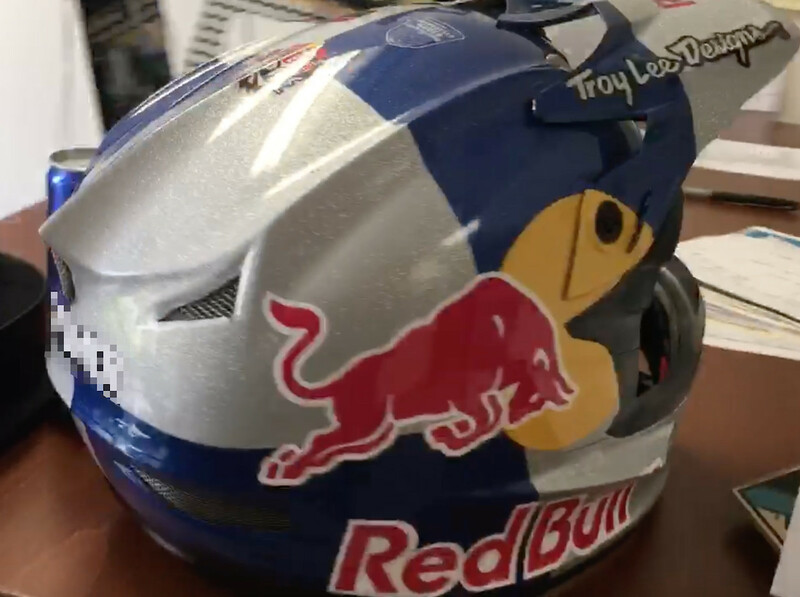 Are you guys just totally ignoring the already mentioned and pretty obvious redbull rampage decal on the top middle of the helmet before making these claims and that Moir, Shaw or Gwin are not participating in this particular event? So the only three guys who ride Rampage this year, and not being supported by RedBull, Monster or Rockstar are Rémy Metailler, Vinny T and PEF. 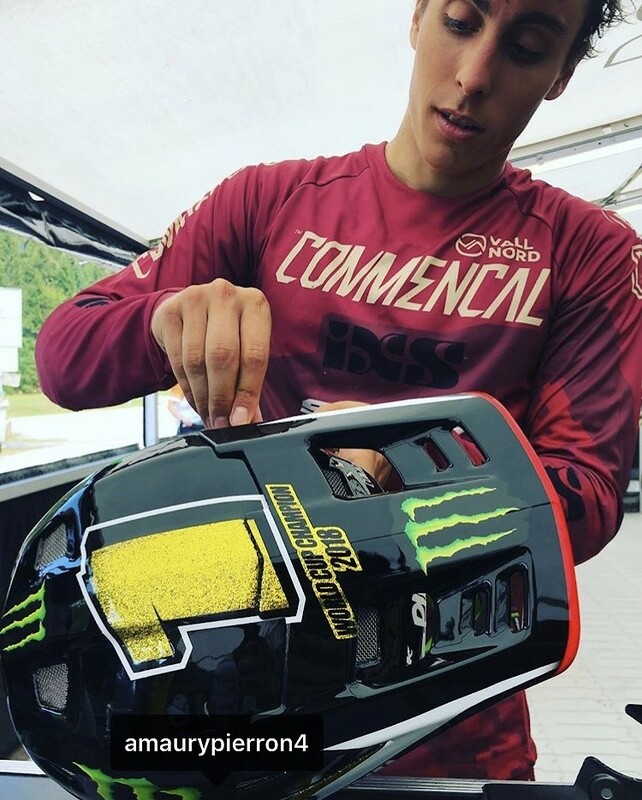 But PEF rides for Fox (and it seems impossible that he has signed with an energy drink brand), Rémy rides for Fly BUT he can have signed Troy Lee too, and Vinny T... my guess, defo on Vinny T.
Sponsors listed as Commencal + Leatt in Air DH results. Strange mistake to make. the new red bull rider is revealed!!! sorry, i had to. it's team rumors after all and there's nothing worthy of talking about yet. if only they sent me a razor to shave my neck. 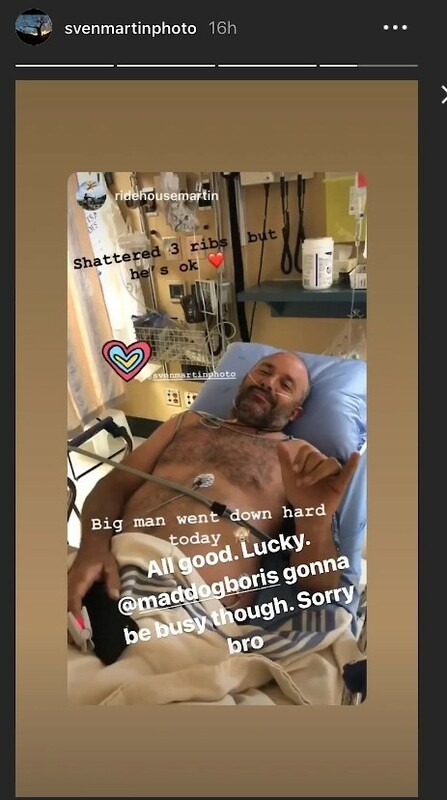 since sven's down for a bit, maybe he can hide in popular whistler restaurants and eavesdrop on team negotiation discussions. wonder why he isn't running DHR2s since they are similar to the aquilas and available in 29er. But that's not Gwin. I've never seen him that unstylish or in That many pads. And that's not the stealth black Tues. That's a black and grey Tues.
Or are you looking at the tire in the foreground? The Kona team moving on from Kore? ...by training with the blue Power Ranger. brendan shopping rides or playing us. courtesy of sven from la bresse today. -Gotta figure Thomas Estaque bumped to Commencal Valnord or other top team. 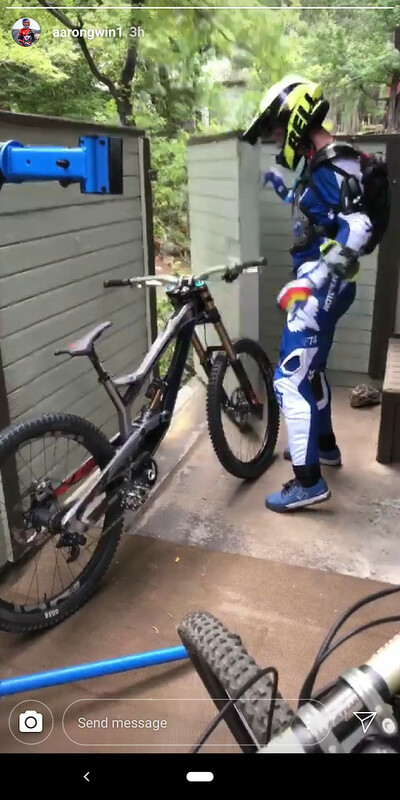 -Scott picks up a heavy hitter and young gun for WC results on the new bike that has been getting teased (Greenland, Moir, Loris?). Brendog can focus on steeze and less on WC results. Maybe kickin' it with ratty and "flying above the smoke" on SCB? -Specialized / Pure Agency deal continues. Speculation. They seem hard to pin down. Finn's contract is up, right? He's gunna git dat cash from someone. -Athertons off Trek to ???. 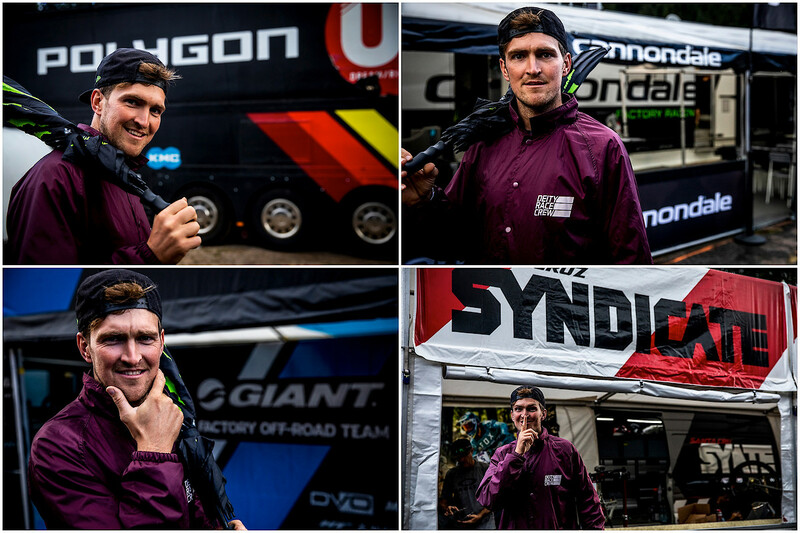 Trek brings factory team in house and signs....wait for it, wait for it......Gwin! -YT goes after some Young Talent. (Could also see Loris or Greenland here). The Gwin / YT colab gave each party what they wanted. Gwin got paid, his fast car, and more $ for the church and YT got validation and WC wins.....and in the end they both finally agree "that was a bit awkward" as Gwin does not fit the YT mold. -Part of me finds it hard to imagine anyone leaving Mondraker. That bike clearly has good juju. $ might be left on the table just to ride that bike. -Connor Fearon is up and leaves Kona. -Intense Factory Racing contracts up? They have some potentially expensive resigns that they wont justify all 3. If Charlie Harrison continues to finish off the season strong, he seems like a good pickup for a team that already has a mega star who can mentor him a bit on that final step to the top. -Tahnee of Transition sadly and chasing the $....dunno? Canyon? Specialized? Can anybody explain why there are so many wink-wink hints at the Rat and 420? I mean, he seems like his head is up in the sky, but if you actually talk to him he is focused and clear-minded. I rode the gondola with him at VdS 2 years ago and he made my day. Very down to earth guy, approachable, thought about the future of the sport, energy drink sponsorships and what not. To me, him quitting DH was a matter of principle, I believe, just like I know Harry Heath's choice was. But if you are laid-back does it mean you are a pothead??? What is that they say? "Where there is smoke...there is probably fire"
Are you saying that someone cant enjoy a little relaxation and still be a focused, clear-minded, stand-up person? Im not sure why you are inferring those things are mutually exclusive? Just because someone might partake and ride bikes, it doesn't mean they are cowering in a corner being anti-social. I have huge respect for the Rat. The only thing that takes bigger balls then racing DH at that level, is probably making the decision he did to step away on principal. Watching him and Stevie race and ride are probably my personal WC highlights in the past 10 years. Mnope, not saying that. Everybody should do whatever the hell they want, if it's not harming anyone else and this obviously is not. Actually, while on this subject I might say that THC being on the banned substance list in sports seems just ridiculous, as I can't see how it can be ”cheating”. But that's another story altogether. I think a lot of people are narrow minded when it comes to this subject and it brings a certain stigma to an individual and that is not deserved in a lot of cases. This is definitely one of them. I walked away from that gondola wearing a huge grin. I already liked Rat, but after talking to him I was sure I talked to a very smart dude with a backbone, a true human being. Seeing him walk away from the scene saddened me, but at the same time I was sure he was doing his thing. And that, as you say, requires balls. It is the same with Harry, although his reasons may vary a bit in nuance. The last time I talked to him he told me how he has lived his dream and how he doesn't think about him as being entitled to leave such a big carbon footprint, if you take into consideration everything that is required to be a pro-racer, plane rides and all. I am sure he is doing well wherever he is right now and I wish him the very very best.